HONOLULU – For years, counselors at Waianae Intermediate would wait for students to be referred to their office or seek help before providing services or information. It was, for the most part, a reactionary practice that failed to address the root cause of walk-in cases. Today, after an overhaul of its program, the school delivers a counseling curriculum through classroom lessons, intervenes in truancy cases with home visits and targeted support, and partners with community organizations to raise awareness about chronic absenteeism. Next month, Waianae Intermediate, along with Nanaikapono Elementary, will be honored as a Recognized American School Counselor Association (ASCA) Model Program, or RAMP, the first such national designation for a Hawaii public school. They will be among 62 schools receiving the RAMP award at the June 30 ASCA’s annual conference in Phoenix. RAMP recognizes schools committed to delivering a comprehensive, data-driven counseling program and an exemplary educational environment. Aligning Waianae and Nanaikapono’s counseling programs to the ASCA model led to improvements in both referral and absenteeism rates, the schools reported. Incident referrals at Nanaikapono Elementary dipped nearly 40 percent to 103 in the 2013-14 school year, compared with the previous year. At Waianae Intermediate, discipline referrals in 2013-14 decreased by 20 percent over the previous school year, while attendance jumped two percent to 93.1 percent. During the same time, Waianae’s chronic absenteeism rate, one important predictor of academic success, fell to 43 percent from 49 percent. The Nanakuli-Waianae complex has set a goal of having all of its nine schools achieve RAMP certification by 2017, said Complex Area Superintendent Ann Mahi, who was named last month as the Hawaii High School Counselor Association Counseling Advocate of the Year. 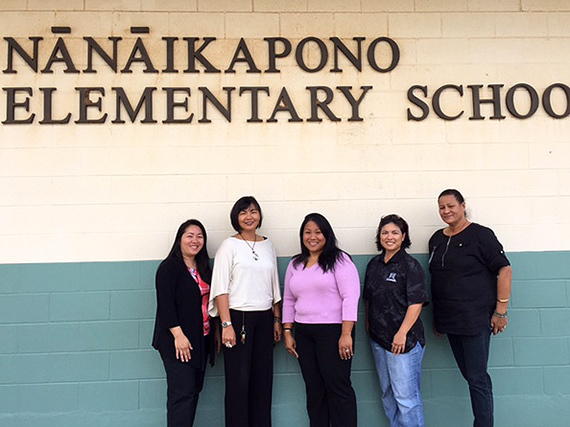 Nanaikapono Elementary’s staff, from left: Counselors Leona Sewake, Maria Marbella and Kimberly Kameoka, and Vice Principals Vicky Nakasone and Jerri Keiki. 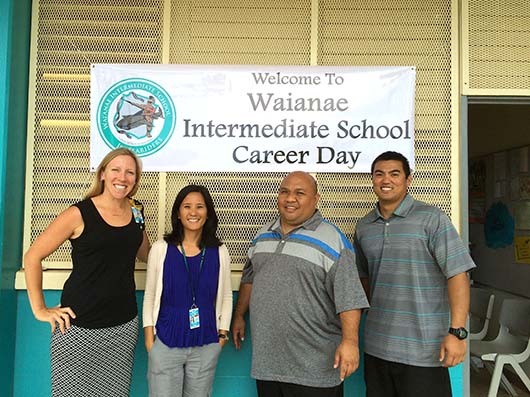 Waianae Intermediate’s four counselors, from left: Kate Gehrke, Elaine Bowler, Dion Bacon and Ryson Mauricio.